Not only are videos a popular form of online content, but they can also increase sales. It has been found that landing page videos can boost conversion rates by as much as 85%. Inviting customers to interact with the video content will improve the effectiveness of your marketing campaign. Unfortunately, marketing tools haven’t kept up with the changes in the video industry. So, many businesses are leaving money on the table because they don’t have the right Calls to Action built into their videos. Inviting a viewer to take action is more than mentioning the opportunity in the video. You need to create the right branding messages and include clickable links that make it easy for the customer to view more information. 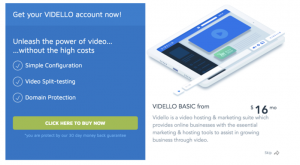 Vidello makes it possible for you to drive sales with links within your videos. The CTAs can be timed within the content, linking each customer to the destination of your choice with a single click. For example, one click on a video button can lead the customer to a checkout page, shopping cart, Paypal payment, or any type of affiliate link that you want to build into the content. You have full control to direct the website visitor to take the desired action, helping to get customers closer to the point where you can close the sale. 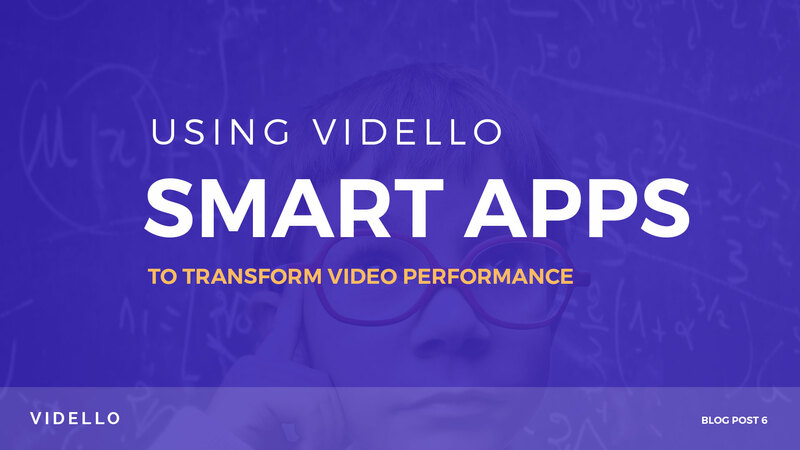 To get the best results, you need to be using Vidello Smart Apps to add professional video links. 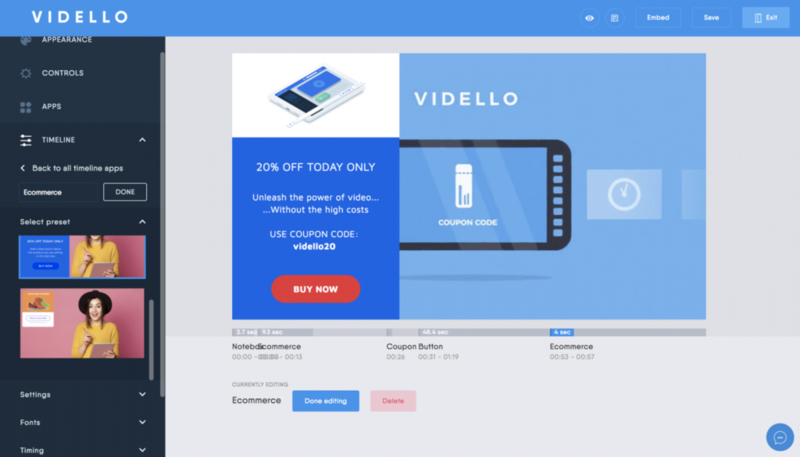 All of the Vidello features are customizable, giving you full ability to place images, text, fonts, feature timing, colors, and even add a skip button. Match these features to your company brand to create clean, classy videos that will encourage your customers to take action. Add a clear Call to Action with a button placed on the video. 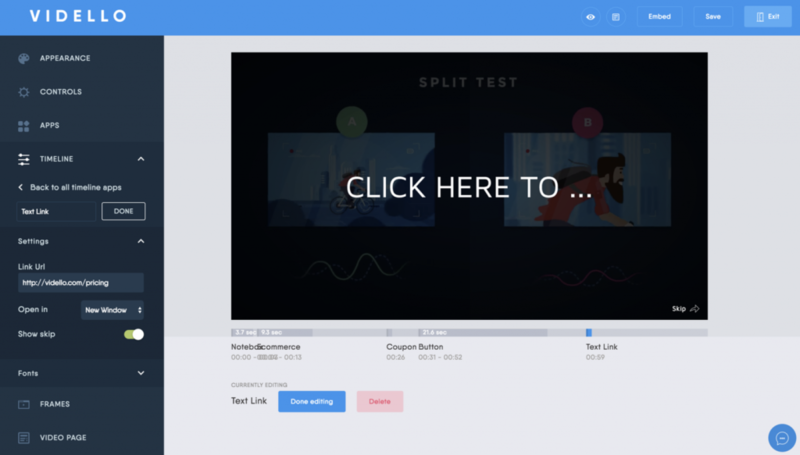 Customize the text, colors, and layout, giving you full ability to split-test the button to improve performance. Test the three templates that are available, or customize the features to create your own design. The Call to Action button can be placed anywhere in the video, timed to match the message that you are sharing in the video content. Then, the customer can click on the link to view more information about the product or service that was discussed. The countdown timer on the button is a powerful way to create scarcity, which moves people to action. According to Sumo.com, adding scarcity to a funnel can boost sales by as much as 226%. Think about the money you are losing if you aren’t using scarcity in your videos! Many times, a Call to Action is designed around an opt-in so that you can build your newsletter list. Smart business owners know that building an email list increases the potential sales that are available. Create a video with a built-in opt-in form. On the Vidello website, go to Settings > Integrations, and you will find a page with my different options of email autoresponders. Each service has a written tutorial showing the step-by-step process to set up your newsletter integration on your videos. Want to maximize the benefits from building an email list? Not only can you increase your email list, but these video features can also be helpful to build a relationship with customers who are already in your database. Don’t overlook the power of dynamic variables in your newsletter content. We offer features that make it easy to implement personification in your marketing efforts. This trend is important to improve conversion rates and help customers feel connected through the content. Check out our recent blog post to learn how you can use dynamic variables in your videos. Whether you want to redirect someone to Facebook or any other link of your choice, you can include a text link to provide access within the video. Type in the name of the link that you would like to use, then enter the URL so that viewers can click on the link to view the page. Do you want to offer a discount for customers who watch the video? Add a coupon to the video and customize it to match your preferences. People love discounts! If a coupon code is offered, then it increases the likelihood that customers will buy your products. Placing a coupon in the content of the video might encourage someone to make a spur-of-the-moment purchase. Plus, experts have found that people spend as much as 46% more when shopping with a coupon. So, coupon placement within your video can boost your customer base and increase the transaction size at the same time. 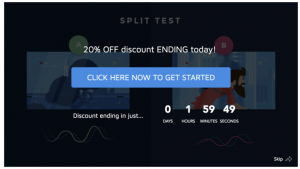 Set the timing for the coupon placement to match the Call to Action in the video, making it easy for the viewer to take action when they are feeling excited about the possibilities. The right timing helps you tap into the emotions of the customer. Link the coupon directly to the product page. Or, the coupon link can even be connected to the checkout page to reduce the number of steps before the transaction is complete. This direct link takes out the guesswork in the customer’s decision to make a purchase. This Smart app allows you to include an image on the video. Add a logo to your video for branding purposes. The best option is to use an image with a transparent background or a .png image so that it blends well with the video content. You have the option to link the image to the URL of your choice. Also, choose the effects to customize the way the image enters and exits the video. For example, the image can slide in from the right/left or top/bottom, or you can have it fade or zoom in and out. Manage the speed to control how fast the effect moves into the video. Vidello allows you to integrate features with the many templates that are built into the tool. If you can’t find the templates that best meet your needs, then you can build your own layout using the image and text features. Anything is possible when you integrate images, Calls to Action, and clickable links into your video content. These features are designed to boost sales, which in turn increases your business profits for the year. If you have a product you would like to sell in the video; then the eCommerce feature is the perfect tool. Include an attention-grabbing call to action, as well as bullet points that highlight product features. The settings give you full control over the colors, button URL, image placement, skip option, and fonts. You can change all of the text and information, including the price, features, and more. Try using the eCommerce templates that are available. Or, design a personalized mini-store within your video by creating custom templates. The eCommerce offering showcases the products that coincide with the content in the video. At the same time, customers can click through the links to add these items to a shopping cart. This dynamic shopping experience gives customers a real-time experience, as if they were browsing a local store. Use eCommerce links to simplify the checkout process so that the customers don’t have to search for the products on your website. Instead, a simple link connects them to the products when they are ready to make a purchase. 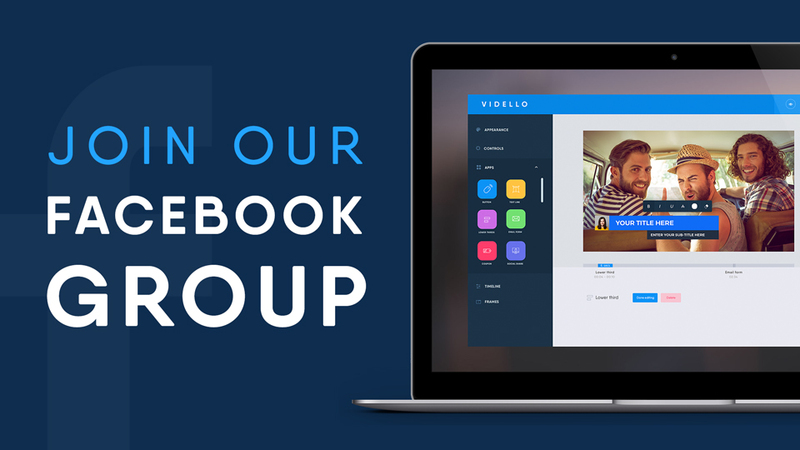 As you can see, the Vidello apps make it easier than ever to customize your videos with marketing messages. These tools help to boost sales and maximize the effectiveness of your video marketing campaign. Feel free to talk to our Vidello team to learn more!